Unlike the Nikkor 600mm f/4, which as a manual focus lens at the time was first introduced in back in 1977, the manual focus 500mm f/4 was only introduced in 1988 after repeated requests to the maker to offer a smaller, lighter weight option as that made popular by arch-rival Canon. The current AF version was introduced in 2007, weighs 3880g, boasts 14 elements in 11 groups (including 3 ED glass elements), and a single Nano Crystal Coat. As well as an ultrasonic type AF motor, it focuses to 4.0m (3.85m in MF) also has the latest 4-stop VR II spec and a sticker price of $8,030 to match. 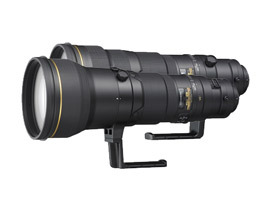 Until only recently the $9,999 AF-S Nikkor 600mm f/4G ED VR was Nikon’s longest and most expensive super-telephoto (though that position is now reserved for the new $17,900 fluorite based AF-S Nikkor 800mm f/5.6E FL ED VR). Even so, the 600mm f/4 can still lay claim to being the heaviest at 5,060g (weighing 470g more than the 800mm f/5.6). As with the 500mm f/4, this lens has VR II, Nano Crystal Coat and one extra glass element, bringing the total to 15 in 12 groups (with 3 ED glass elements), an ultrasonic type AF motor and focuses to 5.0/4.8M depending on the focus mode selected. With a DxOMark Score of 25 mounted on a 36Mpix D800 this is without doubt a high-performance lens, but even while sharpness across the field even wide open is excellent, the Sharpness score of 16P-Mpix (from a theoretical maximum of 36-PMpix) is still a little disappointing. As for the other scores, the 500mm performs well within our expectations for a lens of this type. Confirming user reports, the 600mm f/4 is slightly sharper than the 500mm f/4 and has excellent definition across the frame right into the corners. Despite that, as with the 500mm the sharpness is somewhat disappointing given the huge pixel count of the Nikon D800. Scores for Transmission, Distortion and Vignetting are all excellent, though CA is marginally higher than expected. 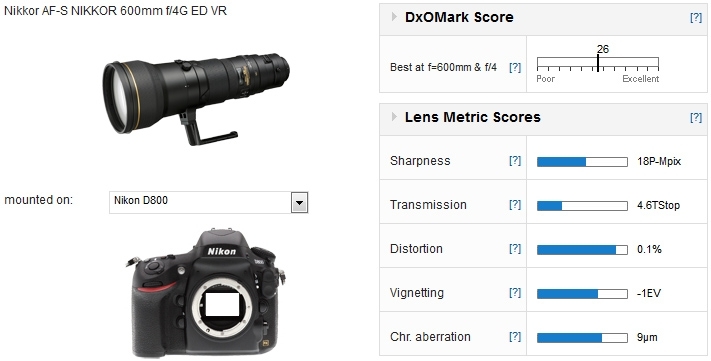 Comparing the 500mm with rival offerings, we can see that the Nikon is very close to the new 3460g $13,000 Sony. 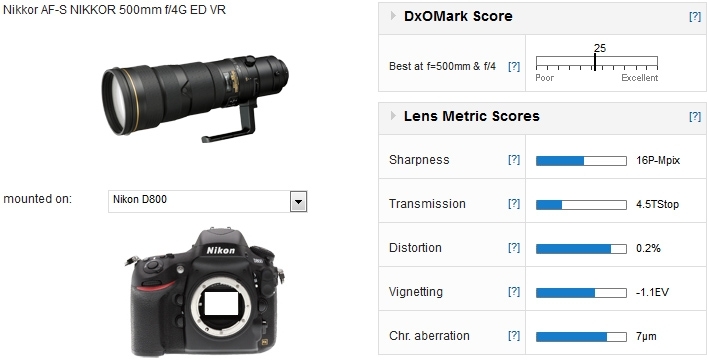 That said the Nikon is slightly sharper at full-aperture and has better uniformity, which is crucial in a lens like this and accounts for the slightly higher DxOMark Score. Compared with the newer, lighter (3190g) and more expensive ($9,499) Canon model though, it can’t match that at full-aperture nor has it the low levels of CA afforded by the three fluorite lens elements. Although the two lenses are extraordinary performers, the Nikon can’t quite match the new $11,999 triple fluorite Canon in sharpness or in lateral chromatic aberration, however overall the two perform very similarly. 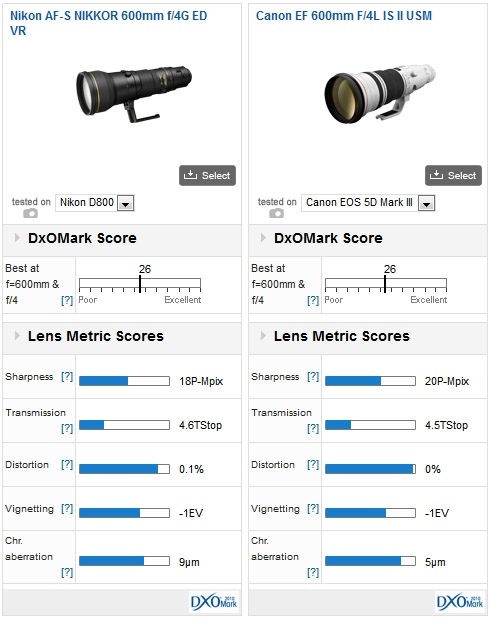 Both have homogenous sharpness at maximum aperture and possess low distortion and vignetting and excellent transmission, but reason why the DxOMark scores are the same is due to the excellent noise and dynamic range of the Nikon D800 sensor. 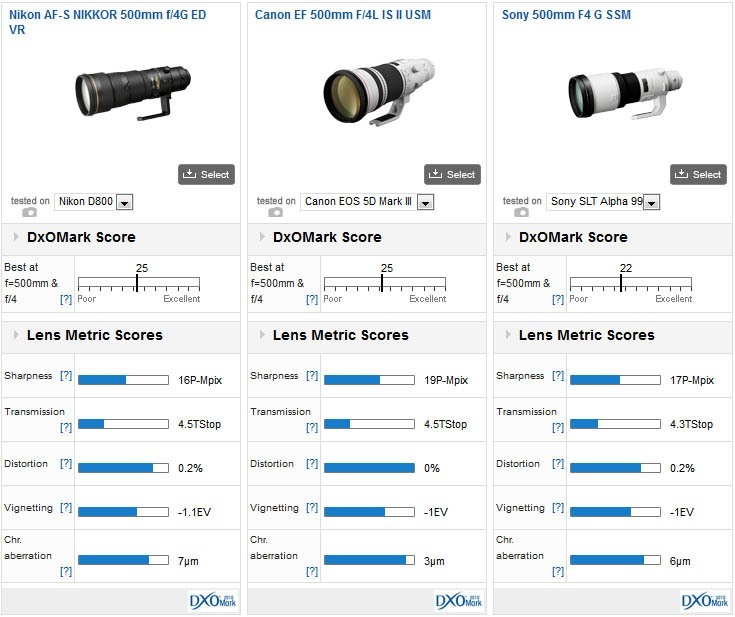 While the benchmark scores are the same for the Nikon lenses as they are for the newer Canon models, in fairness, the metrics suggest the Nikon lenses aren’t quite a match for them in outright sharpness alone. But without a better, higher resolution camera to test them with it remains a draw in IQ. As for price, the Nikon pair are comparatively more affordable and a better value proposition. Either model will assure you of high imaging performance for many years to come and easily justify their legendary status.